In the introduction to last week's Book Notes essay by Peter Selgin for his short story collection, Drowning Lessons, I mentioned how much I admired the Flannery O'Connor Award for Short Fiction winners. 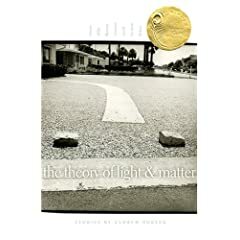 Andrew Porter's short fiction collection, The Theory of Light and Matter, is the other 2008 winner of this esteemed prize. Porter chronicles suburbia in these timeless, well-crafted stories, and this collection stands out as one of the year's most unforgettable works of fiction. ""If you are anything like me, you will read Andrew Porter's The Theory of Light and Matter with the same feeling of simple gratitude that the first readers of Richard Ford's Rock Springs must have experienced twenty years ago: here, you will think, is a true master of the short story, a writer of honesty and plainspoken poetry who knows the human soul in all its light and shadow and harnesses every sentence to the purpose of revealing it." For "Hole," I chose "Black Spider" by the Scottish band post-rock band Mogwai. A very haunting, atmospheric piece that seems to capture the meditative, dreamlike quality of the story well. If I were making a movie of this story, this is the type of music I'd want to have playing in the background as the narrator watches his friend mow his lawn in the hours before his death. "Coyotes" is a story about longing, the narrator longing for his absent father, and so I tried to pick a song that captured that feeling of absence and loneliness. Ryder Cooder's "Nothing Out There," which was actually written for the film Paris, Texas, seems to capture this feeling nicely. The solo, slide guitar, the long, slow notes, the distinctly western feel of the song, all of these things seemed fitting for the story, which actually takes place in the west and references Texas. I don't know a lot about Latin Techno, but I am familiar with music of Monika Kruse, and I thought her song "Runaway" would be an excellent choice for this story. At one point early on in the story, the narrator's teenage exchange student, Azul, asks him to switch the radio dial to a Latin Techno station, then tells him to listen. There's an urgent quality to this music that I think mirrors the urgent pace of the story and also the teenage mindset of Azul. I can imagine him listening to this song, as he lies in bed at night, thinking about his boyfriend or his mother and father back in Belize. "The Theory of Light and Matter"
For some reason the lyrics of this song remind me of Heather, the narrator of this story, and seem to reflect her feelings toward Robert, the older man she's partially in love with, but who she ultimately decides to distance herself from at the end of the story. I also think the quiet simplicity of this song works well with the tone of the story. When an earlier version of this story was workshopped in grad school, one of my classmates came up to me afterward and told me that my story reminded him of this song. The song is written from the perspective of a Highway Patrolman who's brother is always getting in scrapes with the law, a man who's constantly having to bail his brother out of trouble and apologize for him, very similar to the storyline of "River Dog." I've never been a big fan of Springsteen myself, but the one album I always loved was Nebraska, a very quiet, acoustic album that really showcases Springsteen's talent as a songwriter—so I knew the song well, and ever since that time I have always connected that song with this story. I realize that this story takes place in Pennsylvania, not Illinois, but I couldn't very well make a soundtrack for my short story collection and not include a song by Tom Waits. Plus, the lyrics, in every other way, work well (She grew up on a farm there . . . etc), as does the sweet, innocent quality of the song. This was a love song from Tom Waits to his wife Kathleen Breenan, a woman who in fact grew up in "the hometown with spirit." One of my favorites. I've always loved the lyrics of this song, and I think they capture the narrator's longing for love in this story, his desire for his neighbor (and best friend) to dump her girlfriend and "say yes" to him. "Stratford-on-Guy" is probably the best (and maybe the only) song I know of that takes place in an airplane cabin just as a plane is about to land. In the opening of "Storms," the narrator's sister is flying back from Spain, where she has just abandoned her fiancé less than a month before their wedding, and if I were to make a movie of this story, I'd probably start with the sister on the plane, and this is the music I'd want to have playing in the background. A song that's very rhythm seems to augur trouble. I chose this song purely because of the mood it creates. A strange collaboration between The Chemical Brothers and Hope Sandoval of Mazzy Star that actually works well. It's a haunting song and very evocative. I also like the slow, languid beat of it, something that I think mirrors the laziness of hot springtime afternoons in Houston. At one point in this story, the narrator's sister and her boyfriend disappear upstairs during Thanksgiving dinner to listen to the Ziggy Stardust soundtrack and smoke pot. When my book was being copy-edited, I had a lengthy exchange with my copy-editor about the fact that it was technically impossible for the sister and her boyfriend to be listening to this soundtrack (which came out in 1983), since the story takes place in the seventies. She suggested I change it instead to the original Ziggy Stardust album (1972), which I ultimately did. Still, despite the historical inaccuracies, the reason I was so stubborn about this point was because I had a very specific version of "Time" in mind when I was writing that scene. And the version of "Time" that I was thinking about was that wonderful live version from the movie album.